Adams Express Company Building, 1913. Collection of The Skyscraper Museum. If the skyscraper is a “machine to make the land pay,” as Cass Gilbert wrote in 1900, then the Adams Express Company Building was one of the city’s most efficient economic engines. Utterly utilitarian, its white terra-cotta facade was ornamented only with a copper cornice, and its floor plan and facades were essentially extruded straight up, 32 stories, from the edges of the lot, which stretched deep through the block to Trinity Place on the west. Like the City Investing Company Building three blocks north, the Adams Express Company Building was a speculative project, erected, in fact, by the same developer, Robert E. Dowling, and designed by the same architect Francis H. Kimball. It afforded 455,000 sq. ft. of rentable space, making it one of the largest office buildings in the city, with only 110,000 sq. ft. less space than the Woolworth Building. 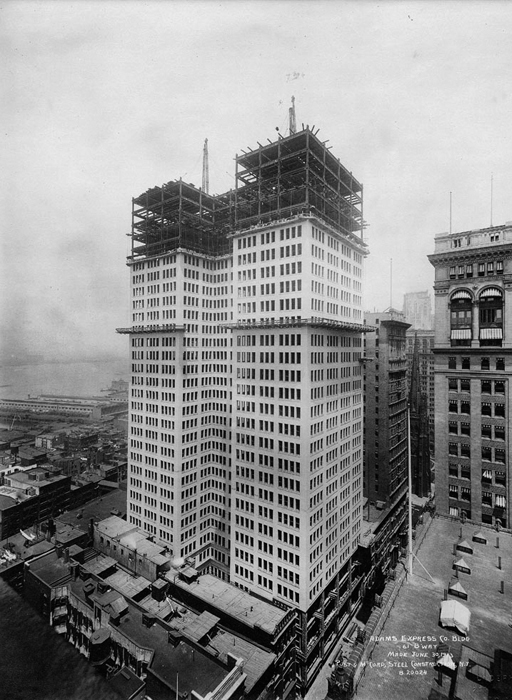 A noteworthy addition to the skyscraper buildings of lower New York is now being erected on the large plot formerly owned by the Adams Express Company on the northwest corner of Broadway and Exchange Alley. It will be thirty-two stories in height, towering to the top of the cornice 443 feet above the surface of Broadway. It will be one of the tallest structures in the city, only being exceeded in the immediate vicinity by the Woolworth, Singer, City Investing, and Banker’s Trust Buildings. The tower on the new Municipal Building north of City Hall Park will be higher, while the Metropolitan Tower at 23rd Street is also superior in height…. This latest addition to the big lower Broadway structures has been designed by Francis Kimball who has been the architect of many well known buildings in the city. It is being put up by a syndicate known as the Adams Express Building Company of which Robert E. Dowling is the head and which bought the property from the Express Company about a year ago…. The Adams Express Company will probably occupy the two lower floors, as that company has had its main offices in the site for more than a generation….The land is assessed at $2,265,000 and the 32-story building for which the foundations are completed is estimated to cost $2,000,000. It is to be ready by Jan. 1, 1911.